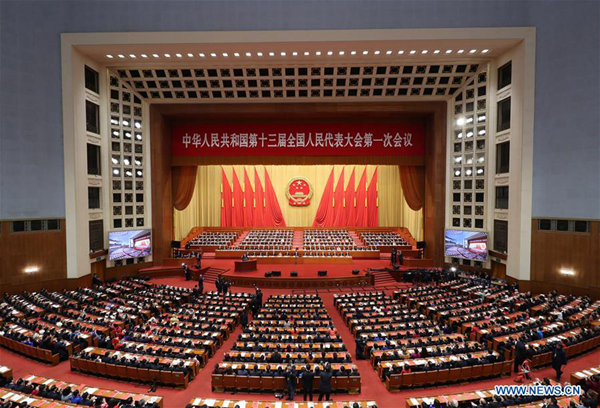 The amendments to the Chinese Constitution adopted by the 13th National People's Congress (NPC) at its first session are sure to have a massive impact on China's future course, steadily steering the country toward higher levels of development. One amendment in particular - to establish a new National Supervisory Commission (NSC) - stands out as a far-reaching plan that could significantly propel the overhaul of the entire political system. After being given a trial run in Beijing, Zhejiang and Shanxi in December 2016, the NSC model was expanded nationwide in November 2017, and is considered an important aspect of political system reform to enhance the state-Party supervision. So how will it function? And why was it necessary to make an amendment in light of the Commission's official approval by the NPC? Stepping into his second term, Chinese President Xi Jinping's political strategy of governance has proved visionary, far-sighted and consistent, and has been particularly crystalized in his signature anti-corruption drive. A deeper look into the campaign's course shows that President Xi believes fighting corruption is not a transient affair that stops with the end of the president's term, but rather a long-term policy. The aim is to uproot corruption on all party, political and institutional levels, leading to the supreme goal of strengthening the rule of law in order to build a unified, well-developed and well-off society. As political corruption leads to economic instability and social unrest - risks that China cannot afford at this particular phase of its steady rise to the world's center stage - a key goal must be to eliminate political corruption within the structures and institutions of the ruling Party to guard the unity and centrality of the Party leadership. The long-standing Central Commission for Discipline Inspection (CCDI), the highest self-supervision body of the Communist Party of China (CPC), has been in charge of achieving this goal in recent years, and has so far jailed or otherwise punished nearly 1.4 million Party members since 2012. That being so far effectively handled, one might speculate as to what the new Commission will add to the anti-corruption fight. President Xi and the CPC leadership realize that the aim of sealing a "sweeping victory" over corruption requires a high-level, all-inclusive approach to administration and execution, and calls for a solid constitutional and legal base, while at the same time following international human rights laws, so that the anti-corruption model can align with the general policy of openness China is pursuing. To this effect, a new National Supervision Law was approved by the 13th NPC on March 20 to outline the powers and functions of the NSC, stipulating that the new agency will enjoy the independent legislative authority to pursue corruption wherever it is, including within the CCDI, with which it will share space and resources. All existing and newly formed supervisory and disciplinary inspection commissions at lower levels will be merged into the new agency, which will be an entirely new organ of the state, with powers parallel to - but not exceeding - those of the executive and judiciary bodies. This is to ensure "full coverage" over all political, legislative, administrative and public services staff of the state functionaries, rather than being exclusive to Party members. The NSC's authority will allow it to oversee inspection and financial surveillance of corruption suspects, in addition to conducting investigations and interrogations. Based on the law, the NSC-affiliated supervisory commissions will be powered to exercise supervision upon their own staff according to clear protocols, and a new detention system will be used to replace "shuang gui," whose practices have been criticized by international human rights organizations. The new system will be strictly regulated in legal terms, where there will be a time limit and a set place for detention, with suspects' full rights being protected. Party leaders consider the establishment of the NSC a major political and constitutional reform, where some constitutional amendments were needed in order to institutionalize the new body and make its wide-ranging powers conformant with the Chinese Constitution, including tackling the issue of some national laws' provisions being suspended when the NSC pilot programs were first launched. Their ultimate plan is to fuse the anti-corruption structures that operate under various state-led administrative and judicial apparatuses as well as Party-led disciplinary inspection agencies, so as to avoid the duplication and overlapping of the work of the Party and the state. This will transform the existing anti-corruption model from an intra-Party temporary political campaign into a comprehensive national project, with the hope that such a powerful new institutionalized apparatus will oversee both the Party bureaucracy and the state bureaucracy and ensure enhanced governance and ethical discipline within the entire political system. China's new National Supervisory Commission, a powerful new apparatus to oversee both Party and state bureaucracy, could drive more ethical operation of the entire political system.